Photo: Silcox Hut. 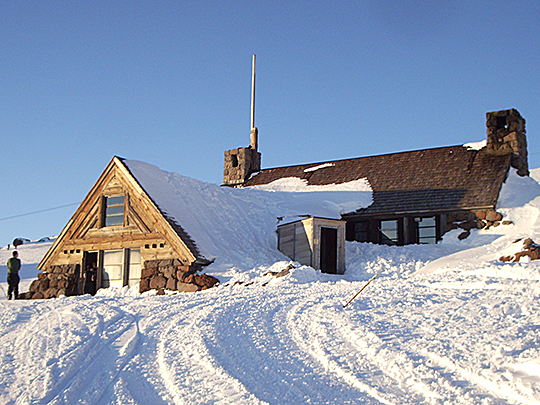 Built by the WPA in 1939 and named for Ferdinand Silcox, Chief of the Forest Service. A low winter snow pack reveals the sleeping area window. The entrance is through the wooden tunnel at center. Listed on the National Register of Historic Places in 1985. Photographed by User:EncMstr (own work), 2006, [cc-by-3.0 (creativecommons.org/licenses/by/3.0)], via Wikimedia Commons, accessed January, 2013. The Clackamas County Courthouse is located at 807 Main Street, Oregon City, OR 97045; phone: 503-655-8360. The county was named for the native Clackamas Indian tribe which lived in the area. Clackamas was one of the original 4 districts created by the Oregon Territory provisional legislature in 1843.